When it comes to baked goods, there are two kinds of people in this world: cookie people and cake people. I’ve always been infuriated when people ask me what camp I fall into because I don’t discriminate against any baked goods. And they’re so completely different that I don’t think it’s a fair question anyway. Cakes are for celebrations; cookies are for everyday consumption. But when asked if I’m a cookie or cookie bar person, I can confidently state that I fall into the latter camp. 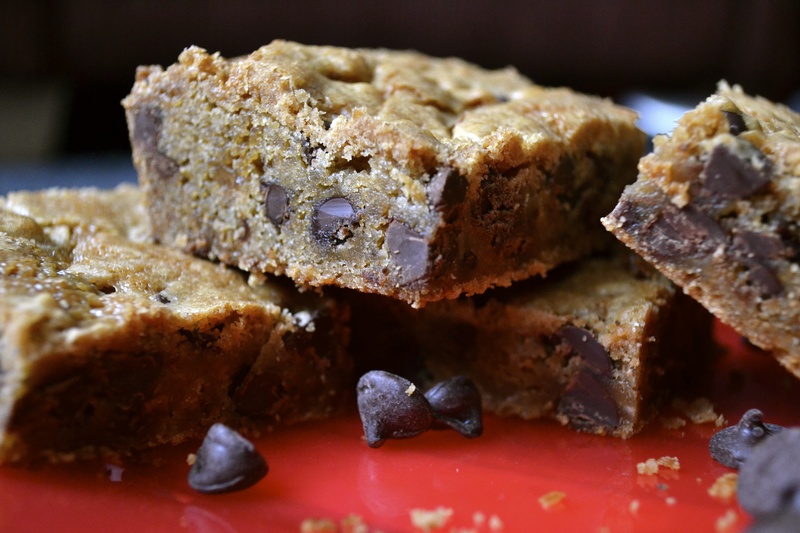 For your sake, I really hope that you’ve consumed a chocolate chip cookie bar at least once in your lifetime. If you haven’t, you need to put down the computer, print out this recipe, and go whip up a batch right now because they are (1) so easy and (2) absolutely delicious. They pack the chewy interior and slightly crunchy exterior of a regular cookie, along with the buttery, vanilla-y, slightly salty goodness that we all love about a Toll House cookie, but then they do it better. 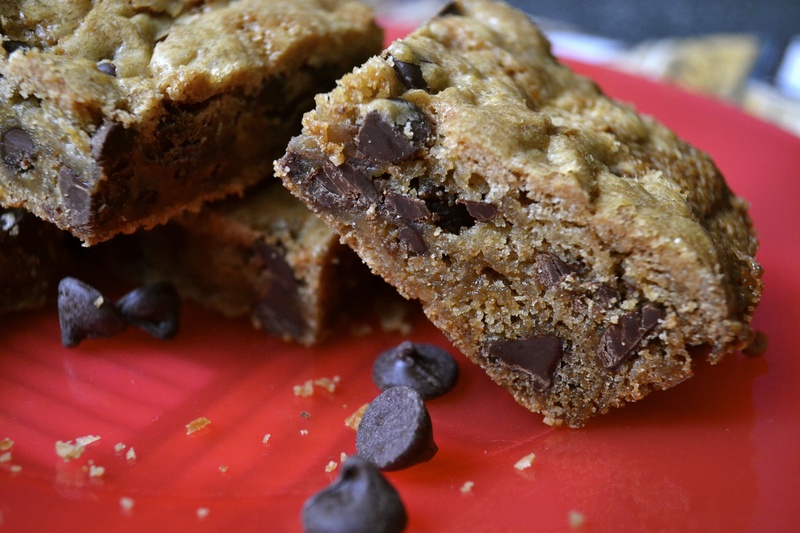 They’re thicker, kind of like blondies, but chock full of chocolate and the consistency is more like a cookie. This recipe is an old standby in my house, and for many reasons. It’s versatile: you can throw in M&Ms, coconut, toasted hazelnuts, or swirl in some peanut butter, Nutella, or salted caramel. 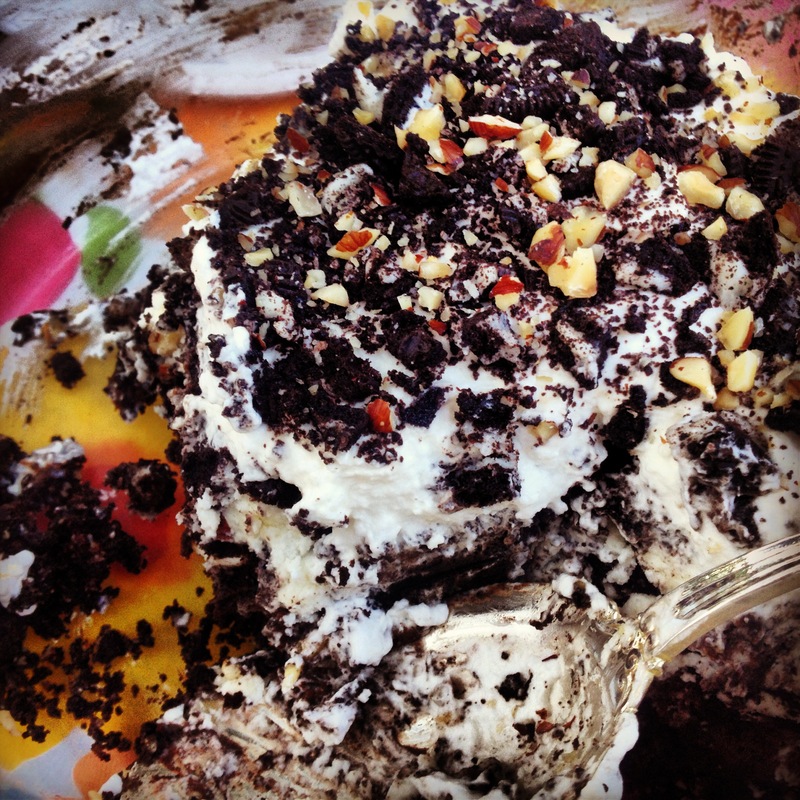 They’re also the perfect base for a scoop of ice cream and a drizzle of hot fudge. It’s too easy: rather than spending as much time rolling out balls of cookie dough as you spent mixing up the dough itself, this dough you just spread in a pan and throw in the oven. I’m all about immediate gratification. And there’s just something about biting into a thick bar that’s intensely satisfying. Chocolate chip cookies have done a good job of keeping their younger, more attractive sister hidden, but I think it’s time that she finally make her debut! Preheat oven to 375°F, and grease a 15” x 10” x 1” baking pan. In a small bowl, stir together flour, baking soda, and salt; set aside. In a large bowl fitted for an electric mixer, combine butter, sugar, brown sugar and vanilla extract; beat until creamy. Beat in eggs one at a time. Gradually add flour mixture, scraping down the bowl between additions. Mix until completely incorporated. Stir in chocolate chips, then spread into greased baking pan. Bake in preheated oven for 20-25 minutes, or until golden brown on top. Let cool, then cut into 2” squares. 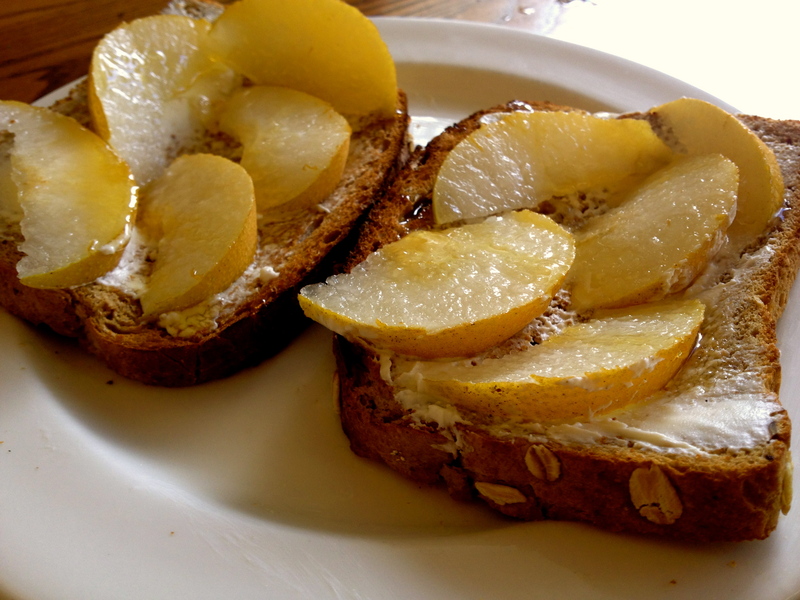 You can also follow Victoria’s baking adventures on her personal blog Sweet Dreams: Adventures in Baking. You know it’s going to be a good night when you walk into the dhall and find chocolate cream pie for dessert. 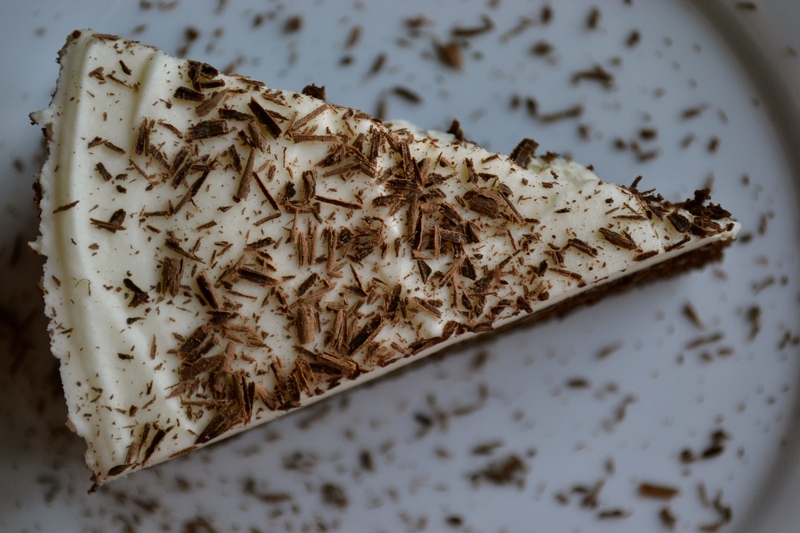 There’s something about the light and creamy chocolate filling paired with the crumbly graham cracker crust that causes your stresses from the day to melt away. I know you know what I’m talking about because the excitement is audible as people first see the night’s dessert offering. There are proclamations of satisfaction. You just don’t get that with the lemon shortbread bars. Needless to say, my Saturday brunch was made when I saw that little mound of sugary heaven. But what if I told you that you could make something with not one but two layers of chocolate mousse? And rather than a disintegrating graham cracker crust that honestly could benefit from a little butter to hold it together, a layer of flourless chocolate cake serves as the base for these two-toned layers of chocolate decadence? Don’t get me wrong; I’ll be the first to admit to embarrassingly excessive excitement when HUDS spoils us with chocolate cream pie. 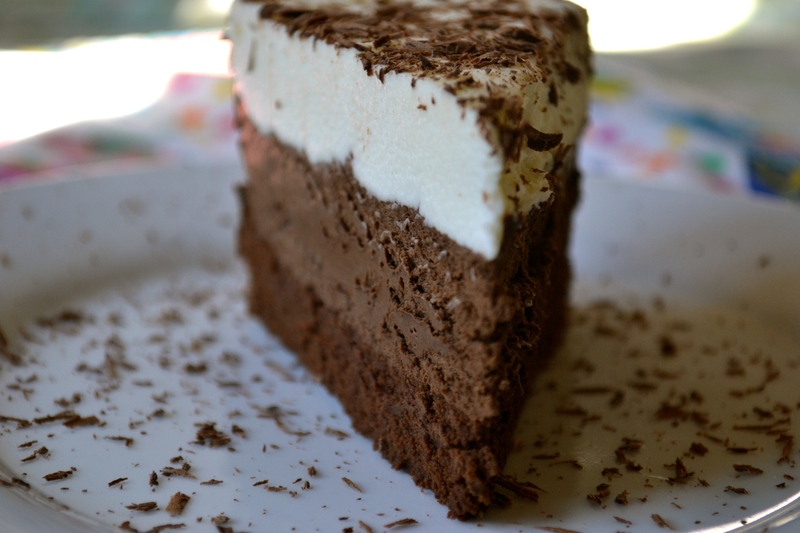 But I’ve also tasted the magic of Cook’s Country Triple Chocolate Mousse Cake and experienced its transformative effect. Maybe the comparison doesn’t work, but the idea is there. The excitement is the same, the thrill of three distinct layers of different colors, the same. Except unlike middle school science class, it’s not water and rubbing alcohol and baby oil, so I can promise you it’ll be much more edible than any retro density-related science project. 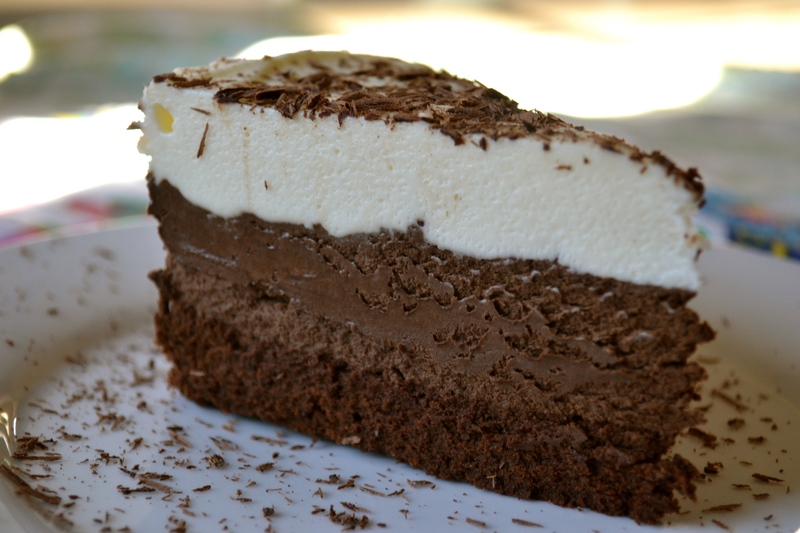 And for everyone who shares my sentiments that chocolate cream pie is HUDS gold, I promise you that this triple chocolate mousse cake will exceed even your sweetest dreams. Preheat oven to 325°F, and grease sides and bottom of 9” springform pan that’s at least 3 inches in height. In a double boiler, melt the butter, chocolate and espresso powder, stirring occasionally until smooth. Remove from heat and let cool for about 5 minutes, then whisk in the egg yolks and vanilla. Set aside. In a stand mixer with whisk attachment, beat the egg whites and salt at medium-high speed until frothy, about 30 seconds. Add half of the brown sugar, beating until combined. Add the remaining brown sugar and beat on high until soft peaks form, about 1 minute longer. Whisk one-third of the beaten egg whites into the chocolate mixture, then fold in the remaining whites with a rubber spatula until fully incorporated and no white streaks remain. Transfer batter to prepared springform pan, smoothing top. Bake in the preheated oven for about 12 – 18 minutes, or until the cake has risen, is firm around the edges and the center is set but still soft (center springs back when pressed gently with finger). Let cool completely, about 1 hour, leaving the cake in the pan. In a small bowl, whisk together the cocoa powder and hot water. Set aside. In a double boiler, melt the chocolate. Remove from the heat and cool for about 5 minutes. In a stand mixer with whisk attachment, whip the cream, granulated sugar and salt on medium speed until begins to thicken, about 30 seconds. Increase speed to high and whip until soft peaks form, about 30 – 60 seconds. This is easiest if the cream and bowl/whisk attachment are cold. Whisk the cocoa mixture into melted chocolate, then whisk in one-third of the whipped cream to lighten chocolate mixture. Fold in remaining whipped cream with rubber spatula until no streaks remain. 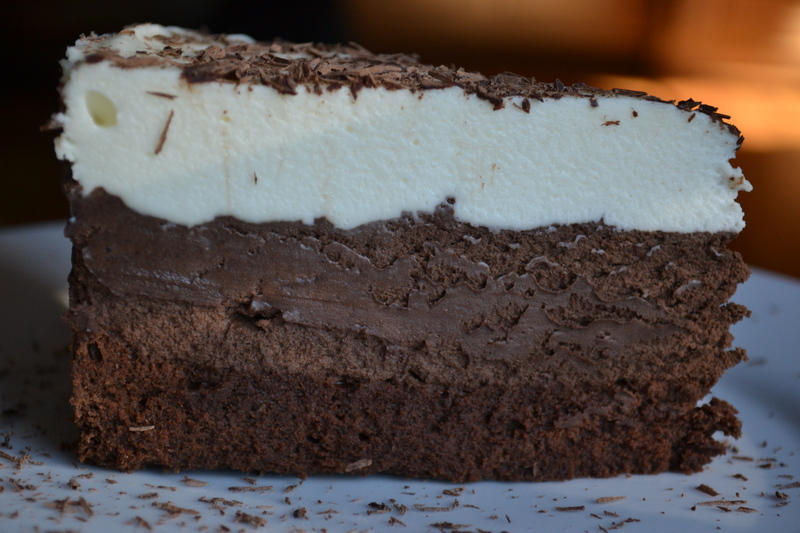 Spoon mousse into springform pan over cooled cake, gently tapping pan on counter to remove air bubbles. Smooth top and refrigerate for at least 15 minutes as you prepare the white chocolate mousse. In a small bowl, sprinkle gelatin over the water and let stand for at least 5 minutes. Place the white chocolate in a medium heatproof bowl, then bring ½ cup of heavy cream to simmer in small saucepan over medium heat. Remove from heat, add the gelatin mixture, and whisk until fully dissolved. Immediately pour the cream mixture over the white chocolate chips and let sit for about 1 minute. Whisk the mixture until the chocolate is melted and mixture is completely smooth. This may require some reheating in the microwave, but make sure to temper the chocolate by using only short intervals. Let cool to room temperature, stirring occasionally; the mixture will thicken somewhat. In a stand mixer with whisk attachment, whip remaining cup of cream on medium speed until it begins to thicken, then increase speed and whip until soft peaks form, about 30 – 60 additional seconds. Whisk one-third of whipped cream into white chocolate mixture, then fold in remaining whipped cream with rubber spatula until no streaks remain. Spoon white chocolate mousse into pan over dark chocolate mousse layer, smoothing top. Let chill in refrigerator until set, at least 2 ½ hours. Remove the cake from fridge and let sit at room temperature for 45 minutes before releasing from springform pan. Dust top with shaved chocolate or cocoa. Before releasing from pan, run a thin knife around sides of cake. 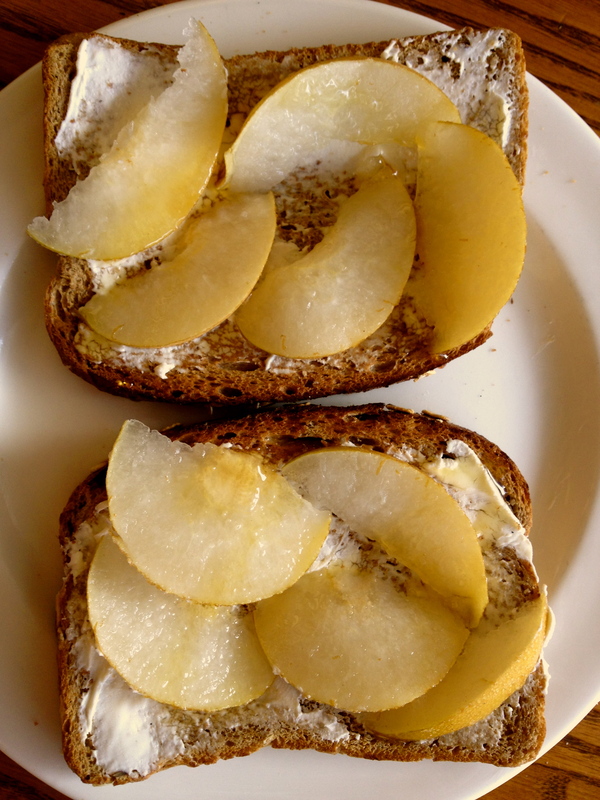 For clean, picture-perfect slices, dip sharp knife in hot water and pat dry between cuts. Enjoy, knowing you’ve exceeded even the best that HUDS had to offer! I’m the first to acknowledge Valentine’s Day for what it really is, or what it should be: the chocolate holiday. If you’re in a relationship, chances are you’ll get a box of truffles with maybe a dozen red roses. If you’re single, rich and indulgent chocolate is undoubtedly better than any significant other anyway. And while chocolate raspberry torte, chocolate covered strawberries, chocolate lava cakes, or just about any form of chocolate all say romance, this Valentine’s Day why not spice things up? Because with enough snow outside to justify two consecutive snow days and even colder temperatures in the forecast, we could all use some warming up. Aphrodisiacs are foods that spark romance. Oysters, avocadoes, chocolate, and strawberries are all examples. Cinnamon, as a spice, falls into this category as well. And because nothing says I love you like a freshly baked batch of cookies, Snickerdoodles would make the perfect addition to your Valentine’s Day celebration. 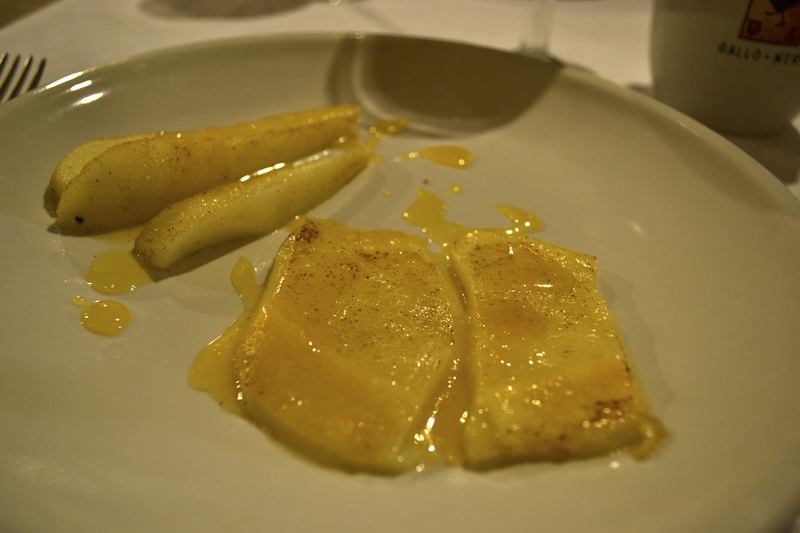 The cinnamon brings the warmth; the butter brings the comfort, and the sugar brings the sweet. Best of all, these cookies are remarkably simple, and they stay moist and chewy for days. The original recipe describes them as Mrs. Field’s copycats, which, while I’ve never had a Mrs. Field’s Snickerdoodle, seems to be the gold standard. Airy but substantial, not too crumbly and ridiculously chewy, the right amount of sweet and the perfect amount of cinnamon, these cookies beat out even some of my favorite chocolate-based alternatives. So this Valentine’s Day, whip up a batch and say I love you in the sweetest, warmest way possible. In the bowl of an electric mixer, beat together the butter and sugars on medium speed until creamed and combined. Once well combined, add the egg and vanilla, and beat on high speed until light and fluffy, scraping down the sides of the bowl. Add the cinnamon, flour, baking soda, cream of tartar, and salt, beating on low and then medium speed, until just combined. Important: The dough must be allowed to chill in the fridge for at least an hour. If you do not give it this time to set up, the cookies will come out flat and will not reach their full potential. During this time, make your special someone a beautiful handmade Valentine. Once the cookies have chilled for at least an hour, remove from fridge. Preheat the oven to 350°F, and grease two baking sheets with cooking spray. In a small bowl, combine the extra sugar and cinnamon for rolling. Using two spoons, scoop dough and roll into balls about 1-inch in diameter. Roll the balls in the cinnamon-sugar until fully coated, then place them on the baking sheet, at least one inch apart from each other. Bake in the preheated for no more than 9 minutes. The cookies may appear under-baked and very soft in the middle: these are done! The cookies will firm up as they cool on the baking sheets, and over-baking them will leave them less chewy and soft. Enjoy with your loved one/best friend/platonic Valentine! These days, one is considered “basic” if she (or he) admits to being pumpkin-obsessed. But I would argue that there is nothing basic about pumpkin. If anything, it’s one of the season’s richest flavors. It has an earthy warmth that’s just begging to be paired with chocolate. It adds spice to one’s life and eases the cruel transition out of Daylight Savings Time. 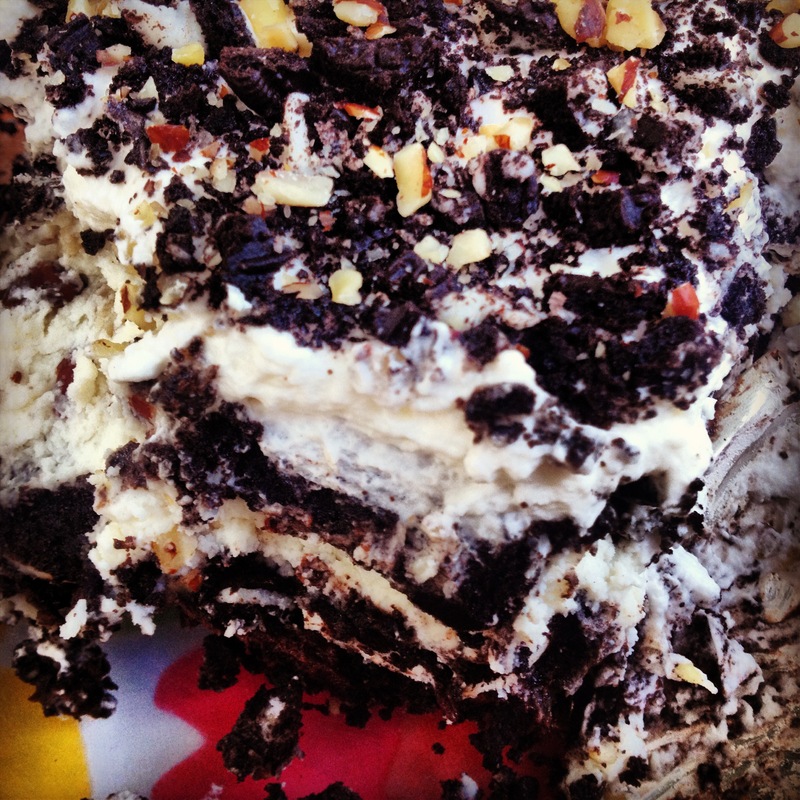 And this snack cake or, more fittingly, golden bars of heaven are certainly not basic. Last year, I made pumpkin bread nearly every three weeks, starting in October and ending in April, not because it was finally no longer winter but because I’d run out of canned pumpkin. I consider this pumpkin bread pretty much unbeatable: it’s the perfect breakfast, perfect afternoon snack, perfect dessert, perfect bedtime treat, and perfect post-exam pity food. But as someone who regularly and genuinely laments that there are far, far more recipes that exist than I can possibly try in a lifetime, I’m always aware of the need to explore new options, and an email from one of my favorite blogs instructed me on exactly where I ought to go adventuring. 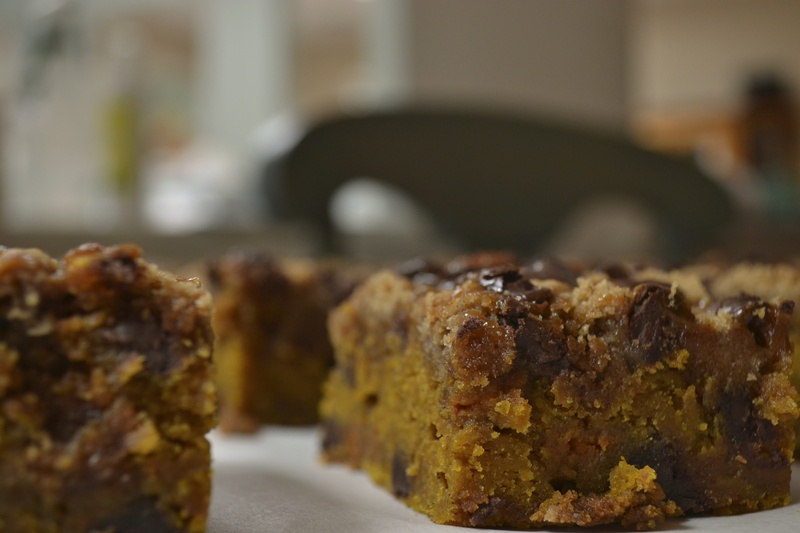 When an email titled “Pumpkin Chocolate Chip Streusel Cake” arrives in your inbox, full of mouthwatering, tantalizing photos, you don’t just let it pass. You don’t simply archive it and let it disappear into the depths of cyberspace. You struggle not to lose your head until you try your hand at creating it yourself. Or at least I do. I couldn’t wait. It had started to invade my dreams. These bars are dense. They are rich. And they are moist. 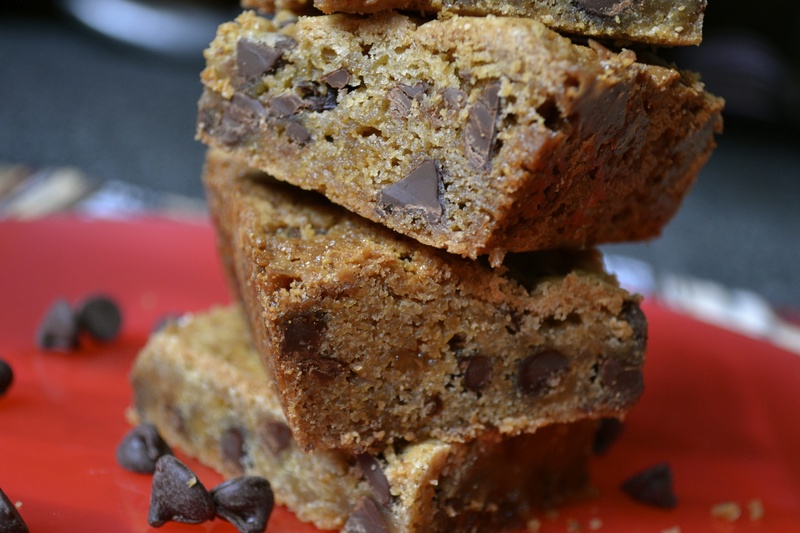 They’re perfectly studded with chocolate chips, and the spices are subtle but balanced. 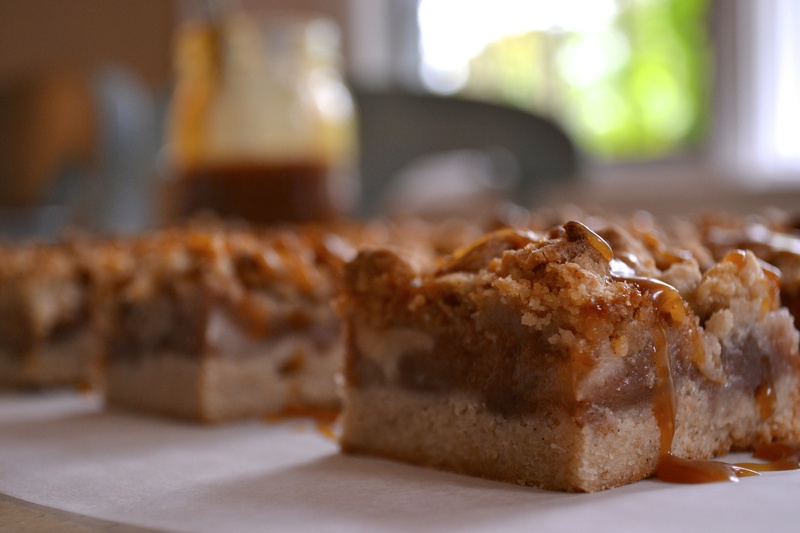 I had some salted caramel sauce on hand from these divine apple crumb bars, so naturally I couldn’t resist adding some to the pumpkin. And inspired by the pumpkin bread that I can never get off my mind, I threw in a handful of butterscotch chips, for they bring pumpkin to the next level, in some inexplicable way. There’s nothing particularly fancy about the cake. It’s simple, and it’s easy to whip together. While I’d still have no shame in eating a piece for breakfast, there’s definitely something about the cake that’s distinctly more dessert-like. Pumpkin pie can be polarizing – it’s sort of a love-it-or-hate-it food – but these bars fall entirely on the love-it end of the spectrum. *When I first made this recipe, I didn’t realize it called for 1 cup of pumpkin puree rather than 1 can of pumpkin puree. The bars were still delicious (though a bit wet), but could’ve used some more spice. For a more cake-y consistency, stick to the 1 cup of pumpkin puree. I think that 1 can (which is nearly 2 cups) makes for a tasty, moist bar if you just add a dash more of cinnamon and nutmeg. 1) Preheat oven to 350°F, and butter and grease a 9” x 13” cake pan. 2) In a small bowl, whisk together the flour, cinnamon, nutmeg, baking soda and salt. Set aside. 3) In a large bowl, using an electric mixer, cream together the butter and sugars. Beat in the egg and vanilla until combined. Add the pumpkin puree, reduce the speed to low and gradually add the flour mixture until just combined. Fold in the chocolate chips. Evenly spread the batter in the prepared pan. 4) Pour about a half-cup of salted caramel sauce over the batter, swirling it into the batter. Smooth over with a rubber spatula. 5) For the streusel, combine the flour, brown sugar, and cinnamon in a medium bowl. Using your fingertips or a fork, add the butter, working it into the dry ingredients until the mixture is crumbly. 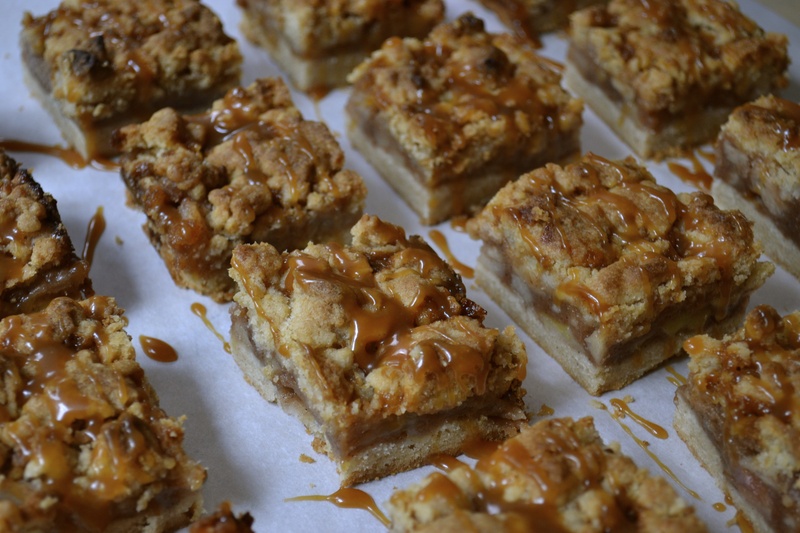 Sprinkle the streusel over the top of the cake, then top with chocolate chips and drizzle with salted caramel sauce. 6) Bake in the preheated oven for about 35-40 minutes or until the sides pull away from the pan and a toothpick comes out clean – there may be some streaks of melted chocolate. Let cool completely on a wire rack. Enjoy – serving with an additional drizzle of salted caramel sauce to be extra indulgent! As a native New Englander, the end of September and the whole of October have always had a special place in my heart. As much as I love watching the leaves turn and feeling a bit of a nip in the air – at last, an excuse to don cozy sweaters and curl up in soft blankets! – I think it’s really all of the desserts that make fall my favorite time of the year. I can’t remember a single year growing up when we didn’t pile into the car in late September for our annual apple picking trip. As kids, we used to eat our weight in apples, but the real treat was always the fresh cider doughnuts that followed. A perk of having two younger siblings is that the childhood activities don’t stop even when you cease to be a kid. So last year, once again I piled into the car with my family, we ate (maybe half) our weight in apples, finished the day with cinnamon sugar cider doughnuts, and left with not one, but two half-bushel bags of freshly picked apples. During the glory days of living in DeWolfe, baking was a weekly occurrence, so it seemed reasonable to bring back a half-bushel of apples for my own use at school. In the beginning, though, I thought I’d been blinded by ambition. Even after making two different kinds of apple crisps and an apple cobbler, it seemed like I hadn’t even begun to make a dent in the apples. Things were going to have to get creative, so I searched my favorite baking blogs for interesting alternatives to the standard apple pie, apple crisp, and baked apples. 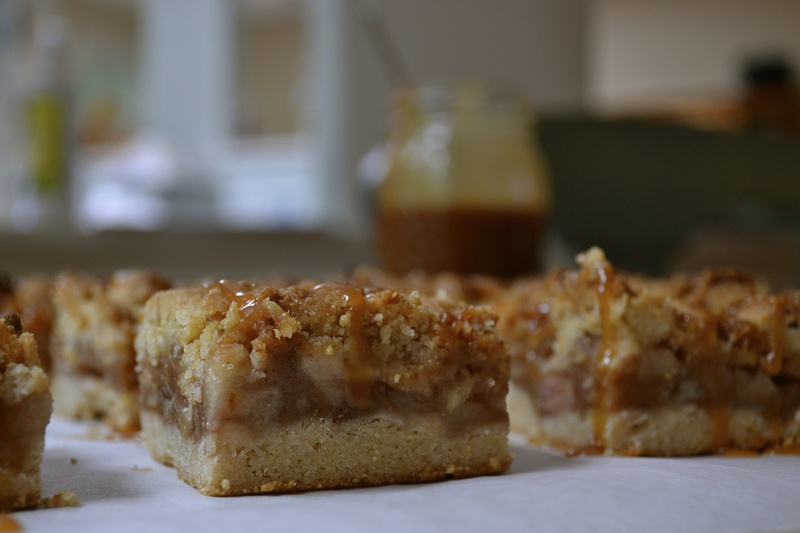 And thus began my beautiful love affair with salted caramel apple crumb bars. I only had to make salted caramel sauce once to become completely obsessed. 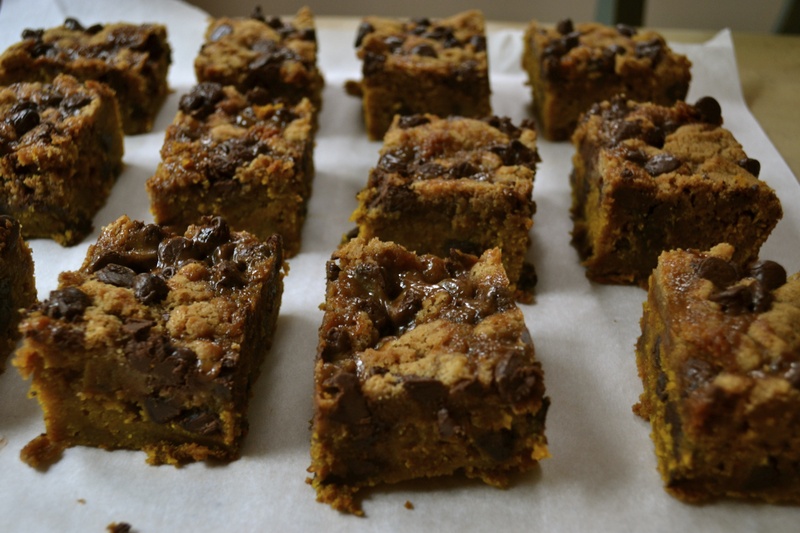 Chocolate chip cookie bars, buttercream frosting, pumpkin bread, I find an excuse to put caramel on and in everything. 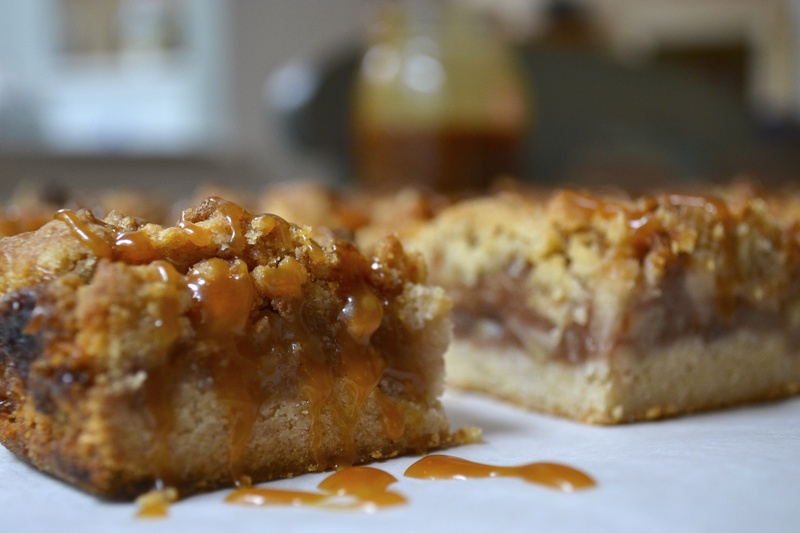 In these bars, the cinnamon-y, perfectly sweetened apple filling combined with the buttery crust and crumb topping are divine on their own, but the toasty saltiness of the caramel cuts through the apples and makes for a mouthwatering combination. Though the recipe has three major steps – making the shortbread-like dough, preparing the apple filling, and making the salted caramel – it’s fairly straightforward, and the shortbread is used for both the crust and the crumble on top. Additionally, store-bought caramel would serve just as well. Preparing the caramel first gives it time to cool and thicken, and then preparing the apples gives them time to soak up all the sugary cinnamon-y goodness. The best part of this recipe? 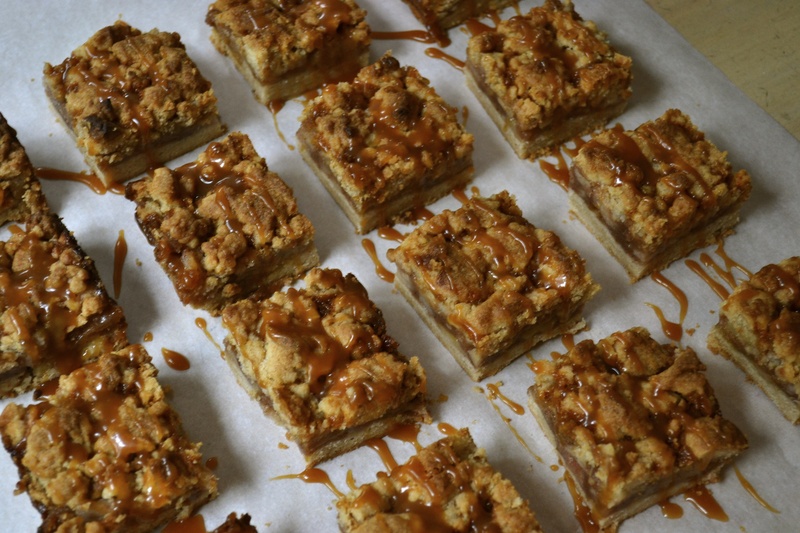 Apples are plentiful in the dining hall year-round, so even if you didn’t go apple picking or even if it’s the middle of February, these delicious salted caramel apple crumb bars are only ever a few dhall apples away! (1) Before starting, make sure all of the ingredients are measured and ready to use so that once the caramel reaches the appropriate stage you can add them without hesitation. *Also, it’s essential that the butter and cream be at room temperature; if they are not, when you add them to the melted sugar, the sugar may harden rapidly into a nearly unusable mess that should be delicious caramel sauce. (2) Heat the sugar over medium-high heat in the bottom of a heavy (relatively big) saucepan. When the sugar starts to melt, start whisking the sugar. The sugar will clump; just keep mixing. Once the sugar is melted, stop mixing and swirl the pan vigorously. (3) Continue cooking the sugar until it reaches a deep amber color. Watch the pan closely so that you don’t overcook the caramel. If you have a candy thermometer on hand, cook the caramel until it reaches 350°F. (4) Once the caramel reaches the right temperature/color, carefully add the butter. I’ll usually add one piece at a time and continue whisking vigorously until it’s fully combined. Just keep whisking. Be aggressive with the whisking. (5) Remove the pan from the heat and carefully pour in the heavy cream, whisking as you pour. Whisk until the cream is incorporated and the caramel is smooth. Whisk in the fleur de sel or kosher salt. (6) Let the caramel sauce cool in the pan for at least 10 minutes. Note: this recipe makes a lot of caramel sauce! 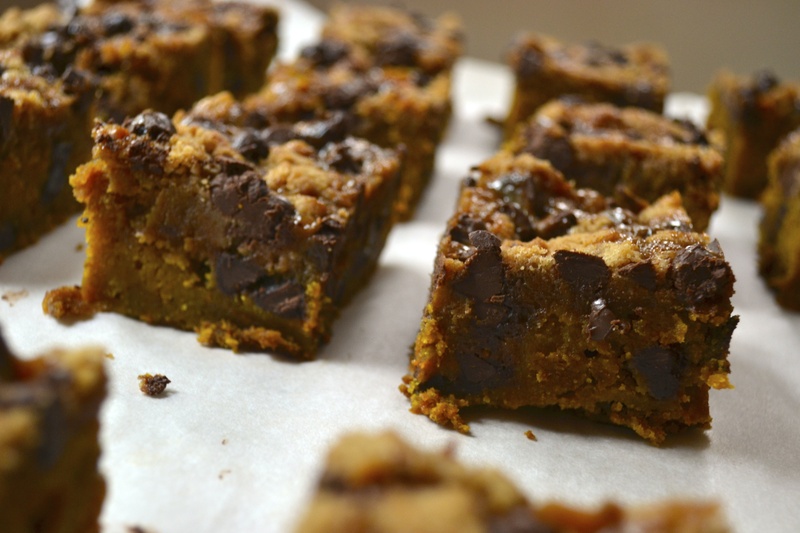 It can be stored in an air-tight container in the fridge for the next time you make cookie bars or decide to indulge in an ice cream sundae. (1) Preheat the oven to 375°F. Spray a 9×13-inch baking pan with cooking spray and set aside. (2) Place the apples in a large bowl. In a small bowl, whisk together the flour, cornstarch, sugar, salt, cinnamon and nutmeg. Pour over the apples and mix until the apples are coated entirely. Set aside. (3) In another large bowl, whisk together the flour, sugar, baking powder, salt, and cinnamon. Use your fingertips to incorporate the butter into the dry ingredients until a few small chunks of butter remain. (4) In a separate bowl, mix the egg and vanilla together. Add into the flour and butter mixture and stir to combine. The dough will be crumbly and a little dry. (5) Pat half of the dough into the prepared pan. Spread the apple mixture evenly over the bottom crust. (6) Generously drizzle salted caramel sauce over the apple filling, at least ¾ cup. Crumble the remaining dough over the apple caramel layer and pat gently. (7) Bake for 40-45 minutes, or until the top is golden brown. Cool completely. Cut into squares and drizzle salted caramel sauce. Note: You can also find cinnamon and nutmeg where they keep spices in the dhall!